One would think with S being our second child, we would be quite used to this 1st Day of School business but being the secondary house for K, even though she is almost 12, we have never experienced the ritual at all. So, of course, in my standard fashion I started preparing weeks ago… Made sure she had a backpack and lunchbox ready, ordered some bento-style plastic containers for lunch. Went to Costco late last week buying all sorts of lunchbox type snacks for my picky eater. Picked out her outfit weeks ago and stashed it away so it wouldn’t get ruined in the meantime… Rushed around last night cutting her name in vinyl for her backpack and lunchbox (because I could never just use a sharpie). I packed a lunch that could probably feed 3 toddlers, just in case, to make sure she ate something. I talked her through everything I could possibly think of to prepare her. Is this really happening? I mean, I have always been a working mom but when I have to leave my babies, I am fortunate enough to have family they stay with. We’ve never done a daycare or school drop off before… Tears? Yes, there were many and they were all mine! How can this be happening? Why do they grow up so fast? 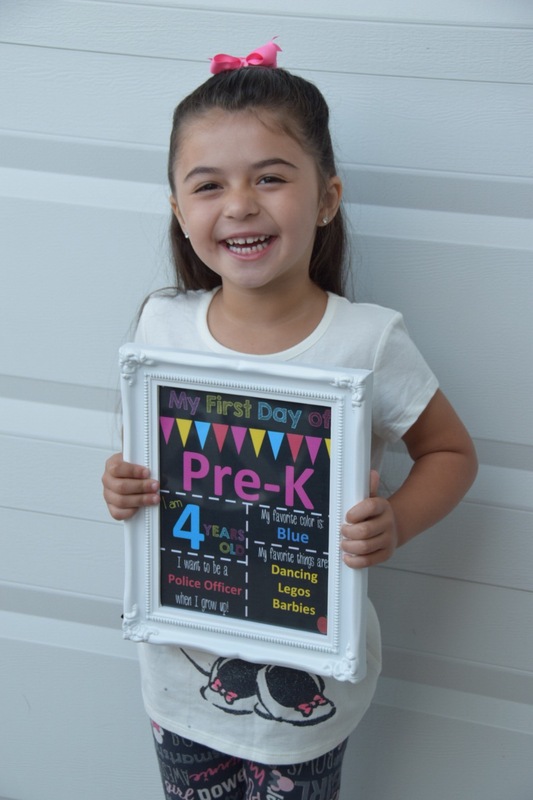 The Shady Lane has an adorable free printable First Day of School Sign that was too cute! I bought a white frame that I can use every year as I customize the sign. So here is my big girl… So ready for the adventure ahead! I love that she is so excited when others might be nervous or afraid. She is ready for the world, I just need to catch up!